Der Artikel Volbeat: Outlaw Gentlemen & Shady Ladies wurde in den Warenkorb gelegt. Caggiano offers a detailed explanation of the chain of events that transpired in adding, "Wow! I have to say I'm completely blown away by the turn of events over the last few weeks here in Denmark and at this point an update is definitely in order. To start with, I came to Denmark about a month ago to produce the new Volbeat record which in and of itself has been an incredibly exciting adventure from a producer's perspective thus far. However, I'm extremely happy to say my relationship with these guys will not end there as it turns out......it's just beginning! Michael had asked me on the phone before I got out here if I would play some guest solos on the new album in addition to my other duties and of course I was thrilled about that and agreed to do so. When I actually got to Denmark and started going through the material, this turned out to be so much more than that. After weeks of collaboration between Michael and I it became quite clear that we had an amazing creative chemistry together and a huge mutual respect for one another. It's so refreshing and inspiring to be creative again on a songwriting level that words can't even describe it and the vibe between Anders, Jon, Michael and I is just awesome. I'd say an artistic relationship like this one is very rare and it's also something I don't take for granted. When the guys asked me if I was interested in joining Volbeat the other day, my jaw just about hit the floor! It actually didn't even register in my brain properly until the next morning but I gotta say, it also didn't take me long to decide. It really isn't the way I envisioned the rest of my year to play out but at the same time, THIS feels more "right" to me than anything I could have possibly imagined and I'm going for it! To all my fans, family, friends and overall supporters that have reached out to me over this last month wondering if I'm ever gonna play guitar again or what I'm up to in general etc........See you all soon my friends and get ready for a wild ride!!!" "Half of the album tracks will take you into the world of outlaw gunslinger stories sometime in the 1800s. Some of the characters are true legends, while others are fiction. The listener will hear inspiration from classic spaghetti western movies which gives you a clue to the album title and cover artwork." Poulsen also offers additional detail on the recordings sharing, "We are still ‘rocking out’ in the studio, and working on the last details. We are very excited about this album. We feel that we’ve achieved the goals we set out. The heavy stuff on the album is perhaps more old school heavy riffs than earlier, and the rock songs rock out with tons of melodies and take us into unchartered territory. All that without losing the Volbeat sound that is the cornerstone of our band." 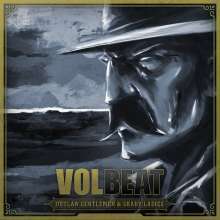 Diese Rezension bezieht sich auf "Volbeat:	Outlaw Gentlemen & Shady Ladies (180g) (2LP + CD), 2 LPs, 1 CD".